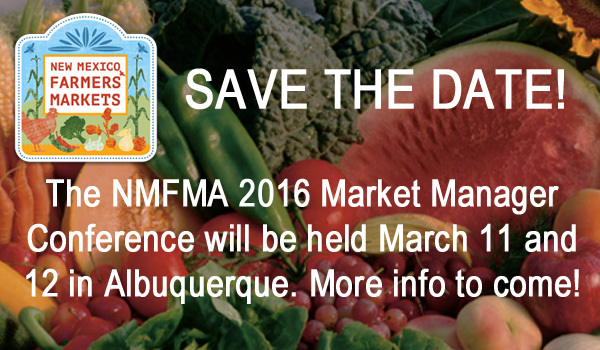 Save the date for the 2016 Market Manager Conference! 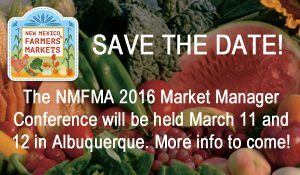 The conference will be held March 11th and 12th in Albuquerque at the Carpenters Union (the same great location as last year). Our theme for this year’s conference is “resilience,” and we look forward to exchanging ideas and information about what resilience means to you and New Mexico’s farmers. In addition, we’ll be holding our Double Up Food Bucks workshop, providing helpful tools and resources, and having productive conversations with others who are interested in resilience for their markets. And remember, the conference is for more than just market managers; we invite you to include your market volunteers, board members, or other interested parties from your community. Stay tuned as we provide additional information on registration and hotel arrangements.